• Why Would I Link? AusEmade aims to provide a simple comprehensive travel web site for Australia. Here you will find information on the various aspects of your travel needs, where to find accommodation, attractions, transport, national parks, adventure, backpackers, outback, wilderness, eco, tours, travel agents, government agencies, flora and fauna, and much more. Many services can be booked and paid for online. AusEmade is a private company and has been established on the internet since March 2000 initially operating from premises in Sydney. Our aim and core business is to promote travel and tourist related businesses and services within the Australian tourism industry. New sections, content, and listings appear daily throughout the site. If you would like to suggest a particular place, story, or section feel free to email us and we will do our best to incorporate the information as soon as possible. For organisations wishing to advertise with AusEmade we promise to beat your current web advertising rates*, with current web traffic continuing to grow from last year, the exposure can make a huge difference to your business. Free listings for tourist related businesses and services are also available. Contributions are also accepted, if you find minimal information about your area of interest you can email us your request to be incorporated into AusEmade. Contributions can be photographs of your local War Memorial, local streetscapes, National Parks, or history of your town, village or region. An appropriate acknowledgement will be published if desired. If you are an Aboriginal tourism operator, for some free promotion get listed. We have some Indigenous artists promoting their work through AusEmade website that include: Trephina Sultan Thanguwa, June Sultan Narpandi-Arpungada, Audrey Rubuntja, Rex Sultan-Jabangardi and Selma Coulthard. Unique from some sites, where known we provide the website address (that contain the contact details of individual travel-related tourist operators), placing them in the appropriate section of AusEmade to make it easier for you to find. If there is a destination in Australia that you are interested in and we currently have no content for it, just send us an email for our team to research the destination for inclusion on our site. If you represent that location, you can even send us content and images, just ensure you have the copyright and permission for any information and photos that we may use. As part of our growth, we will continue to travel around Australia and bring back to our site information on places and our experiences. ** As there are a lot of tourist businesses and government tourism related organisations who promote their services via their own website(s), we will provide links to these sites where known. If we haven't already listed them let us know, or even better, let them know about us and how to get a free listing. Information changes on a daily basis and all attempts are made to keep our information up-to-date. If any information is incorrect, please feel free to email us with the changes. Also, remember, you will usually always get the most current information from the local Visitor or Tourist Centre at your destination. Now that Facebook has rolled out its 'Timeline for Business', we had to add some information about the founding of AusEmade and the day AusEmade was born on the world wide web... and it is all thanks to Wayback Machine that we had a snapshot of the page... making our birth the 21st May, 2001. And finally, if you like what we have done so far, drop us an email by filling in our online form. We would love to hear from you. 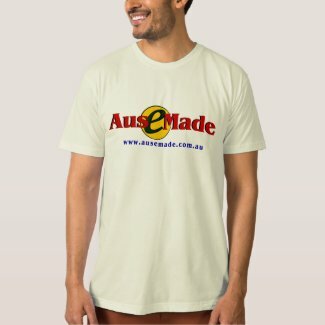 Friends of AusEmade can now buy our T-shirts. * Advertising rates must be publicly verifiable. ** The AusEmade Team are now established in Alice Springs researching and bringing back information about Central Australia and the Northern Territory.